Background from Alabama rescue: Ryder was a stray that lived up the road at our local Quick Mart. My husband Jeff, as well as some other locals around here, would go there daily and feed him. He got to where he would hear Jeff's van and come meet him with wags, hugs, and kisses. We didn't know what happened to him–we thought he was possibly a shooting victim or was injured in a dog attack–but he had a hole in his cheek for several months. We eventually took him to the vet to repair the hole, and they found shrapnel in his face and elsewhere. Nine days after adoption we have to let you know it has been a win/win situation for us & Ryder. He is everything and more than what we were looking for in a dog companion. He had big paws to step into after euthanizing our last dog. Thanks, Carole C for giving us a heads up about the attempt to lift his leg in the house. As I let her know, he tried on his initial entry into our home. It took one loud and instant "no." He respected that and has not done it since. He loves children which is a huge plus. Between two young sisters I watch after school and my grandsons, Ryder has proved to be a safe and sweet pup. He is well behaved and happy riding in the car. He hikes with me everyday. We see hound in him as he is ever alert and ready to go with nose to the ground! But I guess lucky for us he is not a howler. To the contrary, we have only heard him bark 2x!!! His tail seems to wag all day. The only sad behavior I have noticed, is for the first 6 days, whenever he wasn't sitting at our feet, I found him sitting and staring at the front door. At first I mistook this for the need to go outside to relieve himself. But this didn't make sense when he would return to his post to wait a few minutes after being taken outside. That's when we realized he was waiting for someone. We feel pretty sure someone loved Ryder and put some time into him. I am happy to let you know he has given up his post. For the Love of Dogs/Vermont Dog Rescue works with its partners in the South to identify highly adoptable dogs currently in high-kill shelters. Posts about these dogs can be found on the VDR Facebook page as well as on this website, as VDR works to raise interest in fostering or adopting these dogs. We often receive an alert asking if we can "pull" (meaning save) a particular dog from being put to sleep. On Monday, May 4th, Flower came across our radar. as funds to pay for much needed medical care. Within 12 hours we had raised enough money to pull her from the shelter and to vet and board her. 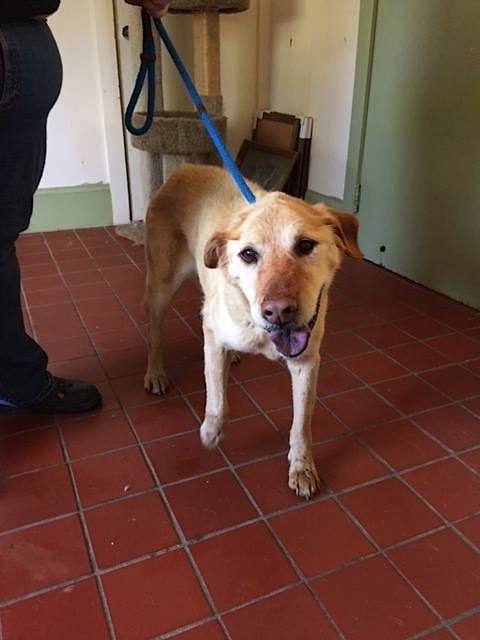 Within 14 hours we had an offer in the Mad River Valley to foster Flower. All great news. Once we identify a dog for rescue we usually have less than 48 hours to find a volunteer to get the dog to safety. Flower came from Floyd County Shelter in Rome, Georgia, a high-kill shelter overloaded with hundreds of adoptable dogs who are put to sleep each week. I was lucky to find a volunteer in Georgia who was able to pull Flower on Wednesday, May 6th. She went to a safe boarding facility called Clippers and Bows, where she was bathed and loved. On May 7th, a vet did a full blood panel and an exam, and Flower was given shots, de-wormed, and tested for heartworm. 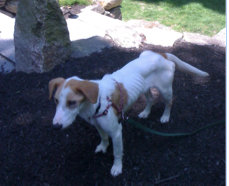 The vet determined that Flower was severely malnourished, starved really. Her teeth were worn down, typical for dogs who have been chained, and she had no muscle mass, also typical of being chained or tied outside her whole life. The miraculous good news was that Flower was heartworm negative. She was given fluids and meds for pain relief. It was suggested that she not stay in a boarding environment, and I was asked find her a foster family in Georgia or nearby. Luckily, our partner rescue For the Love of Dogs in Sale Creek, TN, run by a great lady named Pam Vandergriif, offered to foster. On May 8th Pam drove two hours to get Flower, who happily jumped into her car for the return trip to Tennessee. Flower settled in quite nicely but was nervous inside the house, another telltale sign that she most likely had never been inside a home. The first night was fine, yet Flower kept nudging Pam while she slept, looking for pats and love. On May 10th Flower had a severe bout of diarrhea. Pam rushed her to the emergency vet to have fluids administered and another exam. Flower was dehydrated and had lost 4 pounds since being pulled from the kill shelter. Already undernourished by 10-15 pounds, this was a worrisome situation. Flower stayed at the vet and was given fluids and nutrients. On Monday, May 11th, Flower returned home, where she continues to eat well and is enjoying life. She has become great buddies with a 13-year-old male dog named Shep who has taken a liking to her, too. So sweet. Whoever said seniors could not fall in love? Flower does, however, have some separation anxiety. When she is left alone for any period of time, Flower chews on the window blinds as though she is trying to get outside. Pam now leaves her outside with her friend Shep in a nice grassy fenced-in area where she seems content and at home. Flower needs to recover from the neglect and abuse of her past. It will take time. More importantly, she needs to gain weight and stabilize her body. We expect this to take 4-8 weeks. 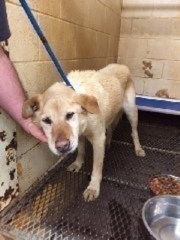 Her foster family in the Mad River Valley hopes Flower can join them in June, but we must wait for her to be healthy enough for transport, which can be tough emotionally and physically on any dog, but especially on seniors. We will keep you all updated on her journey. Thank you for your continued interest in and care for Flower. Your donations have made all the difference, as her medical care expenses as well as her special diet are costly. If you would like to donate to help other dogs like Flower, visit our Donate page. Pam, Flower's foster, took Flower to the vet today. She had not been eating for 1 week. After a blood panel and X-rays she showed signs of liver problems, kidney issues, and severe arthritis. In addition, she had approximately 25 rocks in her stomach that looked like they had been there for a long time. No wonder she wouldn't eat–there was no room for food. Given her age estimate at 14-15 years and the likelihood of her not surviving the surgery due to low body weight, poor health, etc., the vet, Pam, and I made the very difficult decision to humanely euthanize her. This was a tough decision not made lightly. I think of every rescue dog as if they were my own and would go to any cost and length to treat them if needed. With speaking with the vet, this was the right though very difficult choice. Thank you to all who cared for and loved her, even from afar. I am always amazed at my emotion and sincere, strong love for a dog I've never met. My heart and soul go into each and every one of our rescue dogs. Today we lost Flower. But she was loved and knew love from all who participated in her journey: from Janie who pulled her from Floyd kill shelter to Jennifer and her daughter who lovingly cared for her at Clippers and Bows to Barb, Audrey, and others who cared and donated toward her large medical bills and offered to foster, to my dear friend and dedicated rescue partner Pam Vandergriff who always pulls through for our seniors with love, care, vet appointments, and in the end is the one strong enough to hold their heads and comfort them. Pam is the hero here and I can't thank her enough for always being there for our rescue dogs–and I mean always, with heart, soul, and compassion. It is some comfort in this sad time knowing that Flower didn't die alone in animal control but in the arms of a rescue person who loved her for all of us. Heck, she even had a loving boyfriend these last few weeks. Who said we are ever too old to find love? Flower found and felt love from all of us. You would think from looking at my picture that I have had a really terrible life. In some ways that is true. I was born in the wild and ran with a pack of friends in hills of southeastern Tennessee. We found food where we could and slept under the stars in all seasons. A kind gentleman saw us, took pity on us and would throw us food now and then. He noticed that I was being picked on by the pack. The stronger pack members took my share and I was defenseless. The gentleman took me inside his house and fed me chicken broth and mashed potatoes. You see, I can’t chew or drink normally. He figured that I had been hit by a car and had a broken jaw and was blind. Sadly, a few months later the man died suddenly and I was alone in his house for several days before I was discovered. For the Love of Dogs/Vermont Dog Rescue was called and Pam came to pick me up with as many of the pack as she could catch. For months I lived with Pam. She even gave me a sweater but still I continued to lose weight. One day Carole from VDR saw my picture. She’s been working in dog rescue for more than 30 years. She mentioned me to her friend, Candy, who was looking for a special needs dog to adopt. However, I would need a special transport to get from Tennessee to New England. All was arranged and off I went to my new home. When I arrived I was too weak to eat much and could barely walk. They rushed me to the vet for an examination. I had two eye infections, weighed only 15 pounds, had a kidney infection, was dehydrated, and was severely anemic! But everyone loved me immediately. They put me on a special post surgical food made of duck liver, mixed it with water and baby food, gave me IV fluids, and sent me home with medications for my eyes, my kidneys, and my anemia. At first I could only eat small meals and the act of eating made me so tired that I would have to nap for two or three hours afterwards. I was so weak I couldn’t even bark. I was so skinny that I could easily slip out of any harness or collar, so they found me a cute martingale collar. It’s now almost two years later. I’m up to 30 lbs now! My eyes are much better and I only have vision problems in one eye, but I do have to have eye medication four times a day. I still can’t chew because they discovered that I had survived a case of Distemper, which has caused my muscles for chewing and producing tears to atrophy completely. But with a special diet, I can lick my meals that are highly caloric and have added water. I live with a pack of Labs and they love to clean up after me – I mean who doesn’t love duck liver!!!! I am so happy now! In fact I think I live at a Dairy Queen! I have so many canine and human friends. You would never know I had a rough start. I even greet people now and have taken on the job of announcing visitors (human and otherwise) with my terrier howl! And I love my new mom but haven’t forgotten the wonderful folks at For the Love of Dogs/Vermont Dog Rescue. They believed in me and took a chance!